The reading from the Gospel for the Saturday before Theophany is Matthew 3: 1-6. In those days came John the Baptist, preaching in the wilderness of Judaea,And saying, Repent ye: for the kingdom of heaven is at hand. For this is he that was spoken of by the prophet Esaias, saying, The voice of one crying in the wilderness, Prepare ye the way of the Lord, make his paths straight. And the same John had his raiment of camel’s hair, and a leathern girdle about his loins; and his meat was locusts and wild honey. Then went out to him Jerusalem, and all Judaea, and all the region round about Jordan, And were baptized of him in Jordan, confessing their sins. Repentance is at the heart of the Gospel. Everything begins with it, and ultimately, at the end of a man’s life in this world, everything here ends with it: our hope is precisely to die in repentance. Our life, then, is, or should be, one of constant repentance. What then is it, and how can we attain it? How can we live a life of repentance? The Greek word we translate by “repentance” is metanoia, which we need to translate as both “change of mind” and “change of heart” to capture the full meaning, since what the words means is “change of the nous,” the nous being the spiritual intellect, whose entire reality we cannot grasp unless we think of it as the mind joined to the heart. It is the center of one’s personality and existence, the “real me.” One of the Holy Fathers (St. Macarius the Great) has said that when someone is totally living in grace, the soul becomes “all nous” – in other words, everything about the person becomes spiritual, even in this life. This state is also what we call theosis. Even – especially – the greatest saints never stop repenting, even when they are in theosis. How can this be? What do they have to repent of? They keep repenting because they keep on turning their minds to God, and they on keep weeping over their sins and the sins of the whole world, right up to their last breath. The holier they get, the more sins they see in themselves. The lesson for us is, If you are not seeing more sins in yourself, you are not getting holier. It is in the light of this reality, of what a saint is and how a saint lives, that we can understand what repentance is: the constant turning of the mind and heart back to God, away from the ego (the false self), away from love of this world, and away from demonic thoughts. The mind, captivated by the divine beauty, desires to think of God always and His holy commandments, by which one lives, using one’s will and energy to inject one’s love of God into one’s daily activities. The heart, desiring God and longing to be united to Him, unites with the mind in prayer and in action, and puts warmth and life into the actions of the mind and will. When we hear, “Say your prayers! Fast! Do spiritual reading! Go to Confession! Prepare for Holy Communion!” and the rest of the whole list of do’s (and don’ts!) that the Church’s preachers and teachers are always “throwing at us,” it will help us to recall that these activities are not external badges of being “good little boys and girls,” so that others will approve us. They are indispensable means to attaining the purpose of our entire existence. We have to decide between heaven and hell; we have to decide if we wish to attain our purpose and live forever with God in endless growth in love for Him and for all people and all creation, or if we wish for our minds and hearts to revolve now and for eternity around the idol of the ego, an existence which can be named best and simply by that old-fashioned word – hell. So when we get up in the morning and say our prayers rather than indulging our fallen nature, we are not merely checking off an item on a list (though checklists are an excellent thing); we are taking a step towards a blessed eternity. We have turned the mind to God. We have repented. 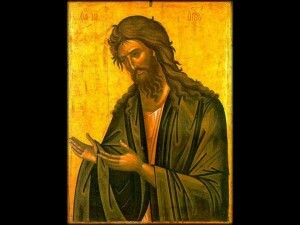 May the prayers of the Holy Forerunner and Baptist John be with us, as we prepare to celebrate the Baptism of the Lord! May this great Mystery renew in us the desire to live according to our baptism and be truly pleasing to God Who is Manifest for our sake. May we live in repentance.